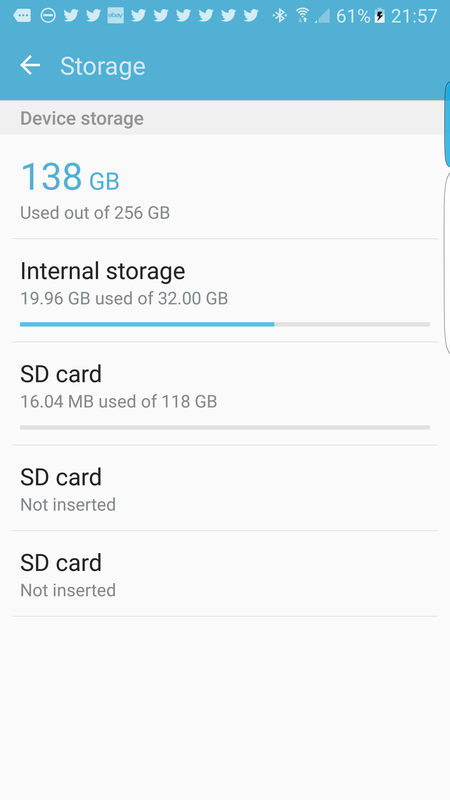 If you've been following the launch of the Samsung Galaxy S7 / S7 Edge, you may have read that adoptable storage, a Marshmallow feature that lets you use the microSD card just like internal storage, is missing. The S7s do include a feature where you can move apps to SD card, but it's not quite the same. The good news? You can enable the feature using ADB and it seems to work great, including in hybrid ('mixed') mode. In order to set adoptable storage up, you will need a computer with working 'adb' and, of course, a microSD card in your phone, the faster the better (I personally use a 128GB EVO+ in my own device. Here's the process! 3. Open your command window / terminal on your computer and type the 'adb shell' command (with your phone connected of course). You will need to enable USB debugging in developer settings (which in turn is displayed by tapping the build number of the device 5 times) in order to see the option. 4. Type 'sm list-disks' to list the disks available for adoption. It'll look something like below - take note of the disk ID (disk:179:160 in this example). 5. Partition the disk. For this we use the 'sm partition DISK TYPE RATIO' command. For example, to partition the disk above as fully adopted storage (aka private) I'd use the command 'sm partition disk:179:160 private'. If I wanted a 50/50 split between adopted and regular, I'd use the command 'sm partition disk:179:160 mixed 50'. Easy right? 6. This process will take a while, but when it's done, the Settings -> Additional Settings -> Storage view on your device should show the new Internal Storage. Note that, for some reason, the total space isn't reported correctly as you can see in this image, however everything seems to work OK. When you install apps, they will generally install automatically to the storage with the most space available, although you can manually move things around if you want to, perhaps for performance reasons (the real Internal storage will likely always be a bit faster). 7. If you want to see another view of how you are doing for space, you can use a third party tool such as FreeSpace or FreeSpace Plus. And that's it! Let us know how you get on, and enjoy your new, expanded S7! Hi, I have a question about this. When I entered the command "sm list-disks" I got 179,0 as the disk. I then proceeded with the next command "sm partition disk:179,0 private" and then it came back to the blank shell command prompt. I've now got device storage 138 used out of 256 as attached and when I use FreeSpace Plus, I can't see the three types of disk - internal, FAT SD and Adopted SD. 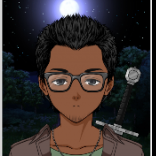 I get something totally different as per picture. Have I done it correctly? In my freespace plus pic I hid and renamed manually, scroll down, they are there somewhere! Your pic looks fine. I mean, the total is messed up, but it all looks OK. Looks like there's 2 cards you can click and 'forget' in the list. what is the process to reverse it and use another card ? is a simple removal of the SD ? or will it require a Shell Command ? You can do the same command with 'public' or reformat the card from the storage UI. I tried moving back the items I had on the SD card but then got a notification saying the storage was nearly full and was showing as red in the Smart Manager. Is there a way round this? I managed to remove the other two SD card not inserted by tapping on them and selecting remove. Also I went back to normal by clicking on the SD card and then there's an option to reformat which I did and it separated the SD card as it was before. I did this because of the notification about storage being full. Great find though and it does seem to work. Have you had any problems with storage after you've changed the SD to adopted storage? I did some looking as I have the same thing where my disk is detected as 179,0. The partition index is changed to 2 instead of deleting 1 and making a new one. Could this be why the file manager displays free space incorrectly? I need to try this using a completely blank card by removing the first volume via gparted in linux. Unless you know a way on Linux to delete the volume of a SD card. Had the same deal with 179,0. Now unable to install any apps as they seem to be trying to go to a volume that doesnt exist. Try at your own risk, at least until this is hashed out better. I think I know the 127,0 issue. I think there is a difference between the Snapdragon vs Exynos versions of the phone. Mine is a UK model which has Exynos. 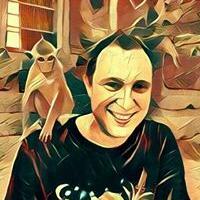 There may be another needed trick to enable proper disk IDs or something. I had a similar issue to one of the previous users. 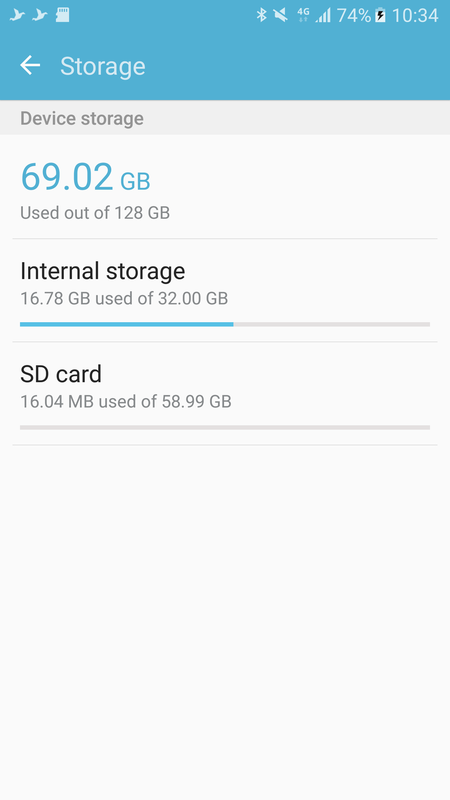 Free Space Plus doesn't really show my adopted storage at all in the list (I took a scrolling screenshot to show the entire list). However, in the Settings Storage menu it appears to be all there aside from the wrong total. Also, I ran into the issue of partition 179,1 becoming 179,2 and I have the Snapdragon variant. However, I haven't had any problems installing apps or any full messages. Yep, I realized after I posted this that could be the reason that FreeSpace Plus wasn't showing my SD card as internal. After I migrated stuff it looks much better here, although the total in system settings is still wrong. This is a great find, except people need to be aware of the downsides to SD cards, at least as a place for apps to reside. That being said, I DO want to have internal and external memory appear as a single drive, while keeping apps in /data/data instead of going to any /storage. This way, you can always find stuff, no matter where an app decides to store its files (camera apps, for example), as well as only having one filesystem you need to back up. Thank You! Makes me very much LESS PISSED. I bought a Samsung 128G UHS-1 card, and now can use it as I want. Surprisingly, in my use so far all my apps are still going to the true internal storage by default. When I Migrated data all my data is now on the SD card while the apps themselves go to internal, which is what you were describing to be ideal, and I agree. Who knows if that will continue but I've installed about 10 apps since adopting storage and all went to internal. Of course YMMV, but that's my experience so far. 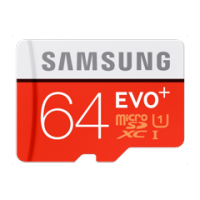 Do you know what the fastest SD card the S7 will support? I would like to use as fast a card as possible. While any pictures I find of the Mirco SD card is of the samsung evo + I am considering buying the SanDisk 128GB Extreme Pro UHS-II ( Read 275MB/s Write 100MB/s). Would you know if the phone would be able to take full use of this card? Also thank you so much for the Adoptable storage method. I was one of the few devastated by the lack of support. The UHS-1 card I have from Samsung seems to be just fine. 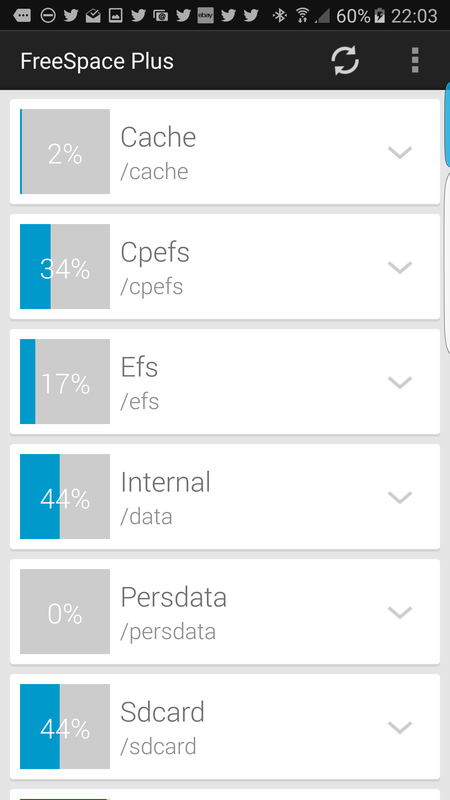 The app Root Essentials on the Play Store can change adoptable storage for rooted and unrooted phones. For the latter option you find the procedure under the info button on the adoptable storage tab. Hey thanks for the heads up about Root Essentials do you happen to know if I use the app to turn on adoptable storage if I can use the app to turn it back off I would like to turn on adoptable storage but would like to know i can go back to normal if I don't like it or notice speed issue.. thanks again! Hey thanks man... it works a treat. I almost cancelled my preorder when I found out they disabled the adoptable storage feature.... moving things to the SD card is a real unnecessary hassle. I have 200GB sd card in now and the phone shows like 256 available space.... its wrong but when i plug it into the laptop the space on the phone shows correct. If I am right you can just format your SD card in settings > storage and it should return to normal.